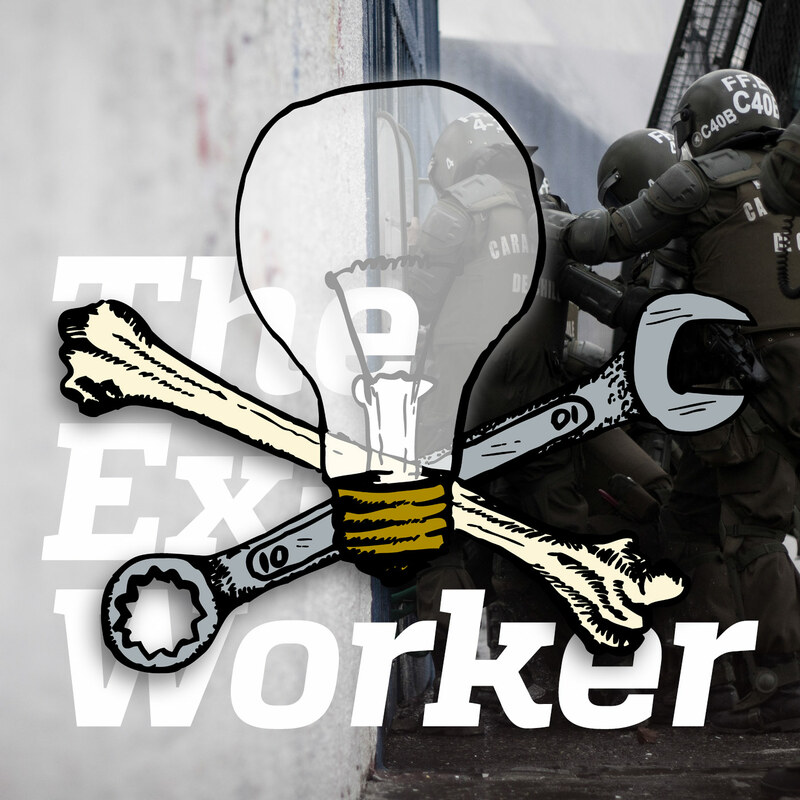 The Ex-Worker keeps our eyes to the south as we continue our in-depth exploration of anarchism in Chile. While our last episode sought to provide context and history, this episode delves into two recent cases of repression by the Chilean State against anarchists and discusses the important of prisoner support in the anarchist movement. We interview Victor Montoya, an anarchist who was framed up and spent 16 months in pretrial detention, as well as Luciano "Tortuga" Pitronello, a comrade who faced terrorism charges after a bomb he was carrying prematurely detonated. While Tortuga's body was damaged in the course of this ordeal, his spirit remains resilient, and he shares inspiring stories and sage advice over vegan sandwiches at the autonomous library Sante Geronimo Caserio in Santiago. We'll offer a review of the Chicago Conspiracy, a documentary film which illustrates some of Chile's radical history and present through music, celebration, memory and riot, tackle some thoughtful listener feedback about democracy and anarchy, and top it all off with news from struggles around the globe. Luciano “Tortuga” Pitronello’s words have inspired us since we reviewed a book of his writings back in Episode 5. You can find the book for sale here, at Little Black Cart. Most of his writings are also available in translation from War on Society, along with an archive of updates from the course of his legal battle. Victor Montoya’s family and friends maintain a Facebook page supporting his innocence; you can find it here. The Social Center Sante Geronimo Caserio , and the Solidarity Raffle which Tortuga mentions in his interview. For a comprehensive list of Spanish and English-language updates about the situation in Chile, peep at our notes from the last episode.. We also found news about the recent arrests on Vice News, but would like to know if anyone has better information form more comradely sources in English. And our Chopping Block review, the Chicago Conspiracy, can be watched streaming for free on our website, and is available for purchase on DVD at Subversive Action Films. Ongoing updates about the situation in Ferguson and account of the unrest after the killing of Vonderitt “Drew” Myers can be found at Anti-State STL. Queer anarchist prisoner Michael Kimble is requesting support after being thrown in segregation for a physical altercation with another prisoner. He’s requesting radical zines and literature. You can read more about his case, read his writings, and find out how to support him on his website, Anarchy Live! United Freedom Front prisoner Tom Manning is up for parole; you can find out how to write the parole board on his behalf here. As promised, pictures of a police station covered in Black paint can be found here! Several accounts of demonstrations in France after the death of anti-development protester Rémi at the ZAD du Testet have been compiled in English on the News of Opposition page of the website Dialectical Delinquents. Bookfair Season! Links to the Tallinn Anarchist Bookfair, the New Orleans Bookfair, the Carrboro Anarchist Bookfair and the Boston Anarchist Bookfair. And we’re reluctant to provide here the link to the Facebook Page for the nation-wide “March Against Capitalism” on November 11th.